Winter weather is slowly giving up its grip here, which means the vegetable garden will be in full swing soon. I have been planting seeds indoors under lights almost daily to get ready. The other thing I do this time of year to get ready for the summer garden is plan what vegetables will be planted in which raised beds, and if there is need or room for any additional beds. Our garden is powered mainly by compost so we don't want to over-build. If you don't have a compost pile, I have to pause here to tell you that you need one! Not only is it a great way to responsibly recycle plant and yard waste, but it is key to growing organically. If you want to know more about composting, see my composting page. I make as much compost as possible to get maximum harvest out of each raised bed. Another great way to get more vegetables out of a small garden is by intercropping and succession planting, and by planning this in advance. Intercropping, or Interplanting is the practice of growing different kinds of vegetables together. Typically they have different growth patterns and therefore don't compete with one another. One example of this in my garden is that I plant lettuce and tomatoes together in the same bed. Tomatoes are planted 2 feet or more apart because they need two feet of space when they are mature. At time of transplant however, they only need about six inches of space. If I only planted tomatoes in that bed, there would be a lot of unused space for at least six weeks. By planting salad crops in that space I get maximum harvest from that space. The lettuce is harvested before the tomato plants require the space. I do the same thing with tomatoes and onions. Succession planting is similar in that when you harvest something, you immediately plant something else in that spot. It can be the same thing or a different vegetable. In one bed, I plant Spring broccoli followed by Summer green beans followed again by Fall Brassicas. I also use beans in succession planting with lettuce and spinach. In my lettuce/tomato Intercropping example you don't succession plant after the lettuce because the tomatoes will be ready to use that space by then. This is the fundamental difference between Interplanting and Succession planting. Sometimes I use a combination of both techniques as I do in my pea beds. In early spring I plant peas on a trellis and lettuce in the front. In one bed, I harvest some of the lettuce and plant bush cucumbers in their place. Later I harvest the rest of the lettuce allowing more room for the cucumbers (intercropping). I also plant vining cukes by the trellis after the peas are harvested (succession planting). In another pea bed, I also plant lettuce in front. Instead of harvesting the plant all at once, I harvest the leaves over and over for my salads and they keep growing back. Eventually when the hot weather decides to stick around and the lettuce gets bitter, I remove all of the plants to the compost pile and plant bush bean seeds there. 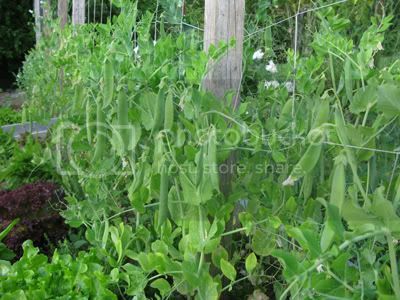 The peas remain on the trellis for several more weeks. The only caution here is that you have to chart where you put everything if you succession plant with seeds. You also have to remember to warn your kids friends not to step on the new bean seedlings while picking peas! 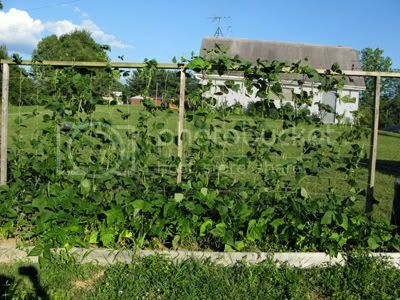 Perhaps the best example of using both techniques simultaneously is when the peas are still producing on the trellis and the pole beans are up but not yet using the trellis. 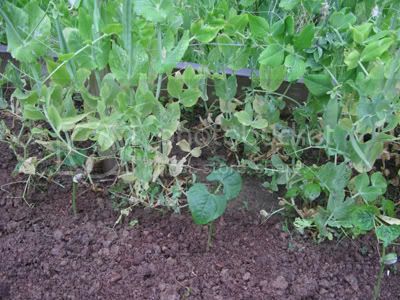 See the small bean plants tucked in amongst the peas? This way, I am able to harvest peas and beans in from the same trellis. Intercropping and succession planting is fun but takes a bit of pre-planning. Sometimes it takes some experimenting too, if you are not sure exactly how long it takes each crop to grow. A very important tip for succession planting is to be sure to add a generous supply of compost or organic fertilizer like Great Big Plants between plantings to re-energize the soil. Growing many plants in the same space uses up a lot of nutrients. That is okay if you concentrate on feeding the soil instead of the plants. This isn't a problem because while the first crop is growing, I'm making more compost. The bottom line is that I'm always looking for ways to maximize the use of my compost as well as maximizing the amount of food that reaches the table. I can hardly wait to get started! My daughters are gardeners too! I still have much to write about our visit to Baker Creek, but for the last two evenings my time was occupied with spring planting. The best part about it was that my daughters helped. Tonight my 14 year old helped plant the third and final wave of the early tomatoes. We planted "Siletz" and "World's Earliest". It was a big help having someone help me remove the plants from the recycled CD spindle containers that they were planted in. We put crushed egg shells in the planting holes to give the tomatoes added calcium. My 11 year old daughter is great with a rake. Last night she worked up the soil in several of the existing raised beds. Another great thing about raised beds is that you can sit or kneel in the grass and reach in to work the bed. Below my daughter is planting red onions next to the first early tomato batch. Onions are great companion plants for tomatoes. Gardening with my daughters is great fun. I love when they want to help, but I never make them. When I was a kid, hoeing the garden was part of my chores and I hated it. It took me many years after that to actually like gardening. That is probably also why I don't like hoes (sorry Carol). I want my daughters to enjoy gardening, and I think they do. They have grown up playing in the garden and helping as much or as little as they want. Now that they are getting older, when they do help, it helps a lot! Why this is great is not because more work gets done. This is great because it gives us some wonderful quality time to talk and be together in nature. I'll gladly take as much of that as possible, even if nothing we planted together grows at all. Gardening with your children is a priceless gift indeed.